Liza Hyatt, ATR-BC, LMHC, ATCS, CCM, RYT-200 is a board certified art therapist and license mental health counselor in Indianapolis with over 30 years of trauma-focused counseling experience. Liza is also a published poet and is adjunct faculty for the Art Therapy Master’s Degree program at St. Mary-of-the-Woods College, where she teaches students depth psychology approaches to imagination. Encountering images as alive and the imagination as healing is at the heart of Liza’s approach to art therapy, poetry, and the creative process. Liza has been engaged in her own dreamwork since 1987. Through working on her own dreams with a Natural Dreamwork practitioner, Liza has found this method of dream tending to be an essential practice that softens reactive ego defenses and frees soul to live with authentic belonging. Having provided art therapy in a domestic violence shelter, a low-income women’s counseling center, a cancer hospital, and an eating disorder treatment center, Liza is now expanding her practice to include Natural Dreamwork, assisting dreamers to compassionately welcome and feel into the images sent by soul to help us heal. As an art therapist, Liza incorporates all forms of creative expression into therapeutic work, including visual artmaking, creative writing, movement and dance, and music. She is trained to teach Let Your Yoga Dance, and is completed her 200 hour yoga teacher training in March 2019. Liza is also a a certified EMDR therapist and finds trauma focused therapy combining both EMDR and expressive art therapy to be extremely effective in helping trauma survivors shift nervous system arousal and rediscover how to connect and feels safe. 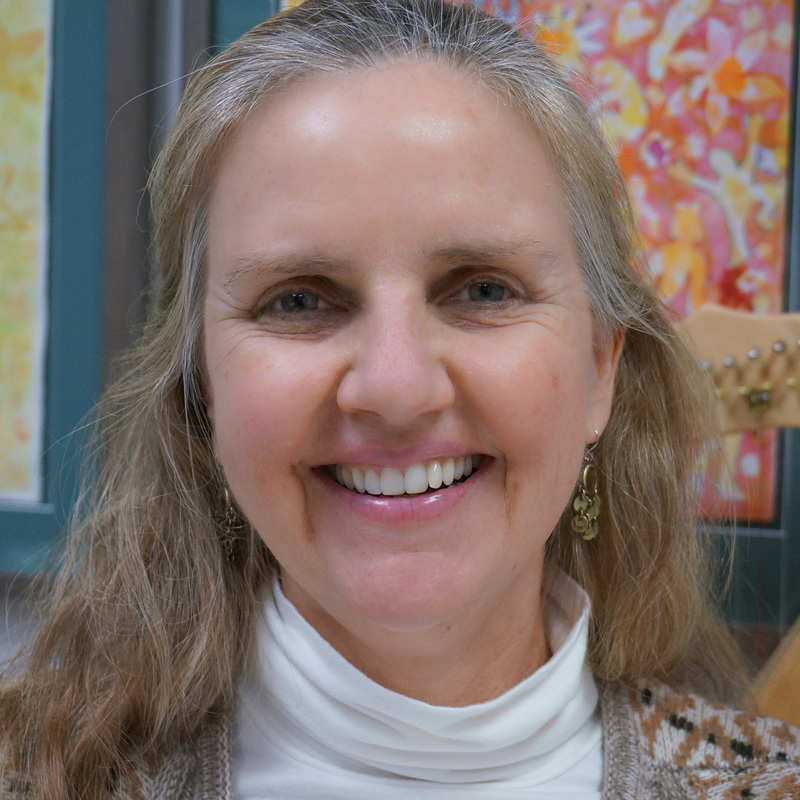 In addition, Liza is a certified clinical supervisor and provides supervision for newly graduated art therapists and consultation and advance training for therapists integrating experiential practices into their work. She worked for 13 years at The Julian Center Counseling Center, facilitating the Domestic Violence Awareness Mosaic project and initiating a community open studio program for the agency. In 2005, she began developing medical art therapy programs for IU Simon Cancer Center’s CompleteLife Department, including the Cancer Mosaic Collaborative and the Cheer Guild Art Cart program. In 2013 she completed training as a Certified Clinical Musician. She has played therapeutic harp music in chemotherapy clinics and patient besides, hospice settings, nursing homes, and yoga studios. Liza is the author of Art of the Earth: Ancient Art for a Green Future (Authorhouse, 2007) an art-based eco-psychology workbook promoting environmental stewardship. She is also the author of three books of poetry – Once, There Was a Canal (Chatter House Press, 2017), The Mother Poems – A Memoir: The Warrior Queen and Her Poet Daughter (Chatter House Press, 2014), Under My Skin, (WordTech Editions, 2012) – and two chapbooks, Seasons of a Star Planted Garden (Stonework Press, 1999) and Stories Made of World (Finishing Line Press, 2013). She has been published in various regional, national, and international journals and anthologies including Pilgrimage, Buddhist Poetry Review, Contemporary American Voices, Soleil, Reckless Writing 1 and 2, Red Silk, THEMA, Pudding Magazine, Indiannual 4, 5, and 6, Flying Island, Branches Magazine, and England’s Tears in the Fence. In 2017, Liza was awarded a Creative Renewal Fellowship from the Indianapolis Arts Council. During this fellowship, she engage in heuristic art-based reflection on her experiences of compassion fatigue, compassion vitality, and career longevity as trauma focused art therapist. In both 2015 and 2006, Liza received Individual Artist Project Grants from the Indiana Arts Commission. This funding in 2015 helped Liza research her Irish immigrant great-great grandparent’s lives building the Wabash and Erie canal and write Once, There Was a Canal. Many of the poems within Under My Skin were created with the help of the 2006 funding . Liza wrote The Mother Poems during the last 5 years of her mother’s life. One of the poems within this book, “What We Write,” was nominated for a Pushcart Prize. The poems in Stories Made of World continue Ms. Hyatt’s exploration of the theme of relationship, specifically the relationship of nature to soul. My name is Robin Colson. I am your local contact person for Center For Change in Orem, Utah. Center For Change is a behavioral health hospital treating women with eating disorders. I would love an opportunity to meet you face to face. Would you have any time in the next couple of weeks when I could meet you and share information about our Center? I’m hoping to get involved with the Indiana Task Force but haven’t had a chance to attend any meetings since moving back home to Indiana from Denver! Please let me know if you have 15-20 minutes. Center for Change is committed to helping women break free and fully recover from eating disorders. Our multi-disciplinary approach leads women to a healthier, more balanced routine, restoring a sense of control and peace in their life. The Center’s clinical staff help the client make the very important transitions from acute inpatient treatment, to residential care, and then to transitional day/partial or outpatient treatment as they are ready to progress on their journey to recovery from an eating disorder. The Center is JCAHO accredited. I am a graduate student currenlty on the track of LMHC at Christian Theological Seminary in Indianapolis,IN. I would like some guidance on how I would potentially become an Art therapist while in a graduate program designed for LMHC licesure. Thanks for your question. Most art therapists prefer to obtain both the LMHC and the ATR credentials, so it is good that you are already at work on the LMHC. Many art therapy master’s programs provide course work so that students can meet requirements for both these credentials. I would check with the American Art Therapy Association to find out what you will need to pursue after completing your current program. Their website would be the place to start researching this. Do you ever provide art therapy supervision? Yes. I do provide art therapy supervision. Let me know more about what you are looking for. Art Therapy at St. Mary of the Woods. I’m applying to the graduate program there. One of the requirements for enrollment is that we have access to other Art Therapists (in my local area) for mentoring, guidance etc…. Please email me and we can discuss further. Thank you in advance for assistance and consideration. This is a question that I am often asked. I am adjunct faculty for the art therapy program at the Woods, teaching the Art Therapy and Spirituality course. I regularly work with students from the Woods for their observations and internships and other needs as they progress through the program, So count me as a resource! You will love the program at the Woods. My name is Danielle Davis and I am currently a Senior at ISU. I plan to apply for graduate school soon at schools that have art therapy program. I am very interested in Art Therapist and want to continue my education and pursue career(hopefully in art therapy). I am trying to find an art therapist in the area that would let me come observe. Please let me know any info you may have. Thanks for your questions about art therapy. I have two graduate students observing me this semester, so adding another observer might make it awkward for clients. In terms of your interest in St. Mary of the Woods, definitely consider me a resource for future internships. I don’t know if you have already found the website for the indiana art therapy association – http://www.indianaarttherapy.org/ This group would be a great resource for you – you could come to one of our meetings and interact with a large group of art therapists in the area. This would be a good way for you to learn more about the field. May all be well with you. Interest in the topic of eco-art therapy is rising, as, some of us expected it to do. Some anticipated it, as you did, with your wonderful book full of geo-sensitivity and Earth-awareness experiences. That is how I recall your book, from my few hurried moments holding a copy of your creative gifts in my hands years ago at the Woods. I have not yet been able to obtain a copy from your website, to use for my students or to do a book review? Did a book review ever get written for the AT Journals? …….. feel the time is NOW, finally, with more folks awakened with eco-angst. Think it is time for an eco-at therapy BLOG? May your many Earth-aware projects by creatively flowing from your early, even visionary awareness of the need for many to move into a better relationship with our Home Planet. Thanks Roberta. I would love it if you would write a book review for the AT Journal for me, if you are interested. I can send you a copy if you want. Hi Liza, I am an art therapy grad student working with cancer patients in Erie, PA and wondered if I could connect with you about creating a group mosaic. I would like to do the project within an hour and a half art therapy support group and am not sure how to proceed. It would be wonderful if they could choose the imagery but how could I get it all together within one session? And do you usually have them work on individual tiles that are then put together? I imagine that otherwise it would be hard for them to work at the same time. I would appreciate any suggestions you may have. There are lots of logistics to group mosaic! I do not do the separate tiles added into one method. If you can allow for two hour and a half groups, you will have a back up session if it doesn’t get done all in one. The size of the surface you use is crucial – the larger it is, the more time it takes, obviously. In a group of about 6 partial hospitalization patients recently, we created a small mosaic of about 14″ x 14″ in a session. The design of the mosaic had to be fairly simple – a geometric pattern showing the recovery process. IF you can allow for more sessions, you can devote one to planning the collective image of the group. The best way to integrate group mosaic into your art therapy process is to start small and see where it takes you. For my first one, I made a mosaic among a group of colleagues to test out the process first before trying it with clients. Let me know if you ahve more questions. 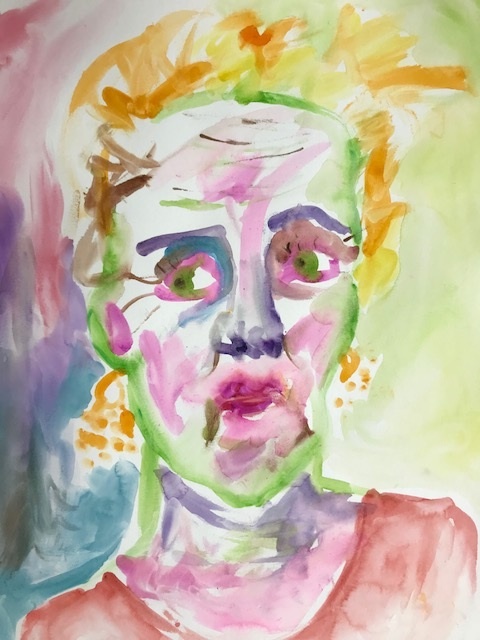 Hello Liza, I am an art therapy graduate student who have worked with cancer patients in hospitals and community art centre in Montreal, Canada. I am finishing up my thesis and the theme of my thesis is “How mosaic artwork could be used in a community art centre to assist post-treatment cancer patients reconnecting with their lives?” I was researching journals and books related to this question and come across your web site. I was wondering what kind of glue you were using in the blog post on Nov 18, 2009, “Mosaics and Healing”. Was it an ordinal liquid glue stick with broken ceramics pieces? Does it solid enough to hold? What is the backing (e.g. wooden board?) I imagine it would be too difficult or challenging to use usual mosaic materials such as mortar and grout with cancer patients due to the strong smells, and etc. If you could let me know your usual mosaic making process with materials when you work with cancer patients, I would truly appreciate it! Thanks for your questions. You are right, I avoid mortar, tile adhesive mastic when working with cancer patients. I use Elmer’s Glue All liquid glue which holds the broken ceramic pieces well. I use a cement backing board. The product Hardi-Backer is the cement board I prefer because it is easily scored and cut to make smaller pieces. Wooden board will work also and for small mosaics I have recently found that fairly thick foam core poster board works well enough. I use sanded grout. Individual, small mosaics, the cancer patients grout themselves. For larger community mosaics, I most often grouted them myself due to the timing of our workshops being four hours and the glue needing more time to dry before grouting. Let me know if you have other questions. I would be interested in your thesis. Not a lot of art therapy writing has been done about mosaics which are such a powerful art form.